If you are having your Dominican Republic vacation planned out by a travel agent you will likely be hitting the larger beaches and resorts like Punta Cana, Boca Chica, La Romana, Las Terrenas or Puerto Plata. These are all larger beaches and towns and like most tourist locations are probably going to be packed with people. Sometimes though, it is nice to hit one of the “off the beaten path” locations. One of my favorites is Castillo Beach in La Isabela in the northern part of the Dominican Republic. Like most of Dominican beaches Castillo Beach is pretty crowded on the weekends, to us, when is really shines in during the week. On most weekdays the beach is pretty close to empty and doesn’t start picking up until the late afternoon. That makes it a nice quite beach to relax on, but is still has the advantage of having services right on the beach (unlike most of the other quite beaches we go to). One thing to point out though is that I am not talking about “resort quality” services. You should be expecting a laid back atmosphere with beach huts for the services. However you can find most of the necessities there are “flush” bathrooms (fairly clean), changing rooms, a few small restaurant / bar combinations and lots of sand and water! One of the reasons my family likes to head to different beaches is the variety of shells and fish. Each beach we go to has something different. One item that is unique at this beach are the unusual sand dollars. You can walk (with water shoes, there are urchins) out onto shelves and pick up sand dollars. As you can see from the pictures these sand dollars are a little different. They are much thicker than most sand dollars I have seen and they have a cool star pattern that is raised up from the shell. You also find a lot of different colored urchin shells on this beach. Most of the fish I have seen are pretty small, although I haven’t went very far out. There are areas of deeper water, but you would have to get out past the shelf to see larger fish. Castillo beach is a good beach for children. So far I haven’t seen much in the way of waves (very poor surfing beach) and the water gets deeper very slowly in most areas. This beach also has plenty of trees fairly near the water so you can get out of the sun if you like. 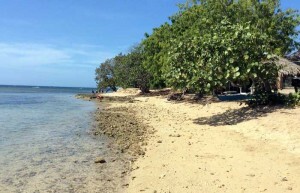 If your looking to visit the Dominican Republic during this next year now is a good time to book at some of the all-inclusive resorts in Puerto Plato. There are two resorts offering deals right now both of the resort are going for $24 per night per person. For an all inclusive this is an excellent price. All-inclusive means that all food, drinks (including alcohol), tips, and the room is included at one price. This is one of the easiest ways to visit the Dominican Republic and helps to make sure that you can stay with in a budget without sacrificing what you want in a vacation. I haven’t stayed at the Confresi yet. This is a newly opened resort that has 180 ocean side rooms. There are different rooms available some with kitchenettes, a hot tub in the room, and other extra features. All rooms include a King or double beds, air conditioning, mini bars (stocking is included with the all-inclusive price), hair dryers, TV’s and YES, HOT Water. Pretty funny that that has to be listed, but you will find many of the smaller hotels don’t have hot water although that is pretty rare fore the larger resorts. Those of you who like to frequent Las Terrenas in the Dominican Republic probably remember the fire that took out at least 15 beachside businesses in Pueblo de los Pescadores. I’ve got some videos that were taken right after the fire on my “Fire at Pueblo de los Pescadores” page.I spent the last weekend in Las Terrenas with my family and it looks like the businesses are about ready to reopen. While Las Terrenas has quite a few great restaurants Pueblo de los Pescadores was the only area where you could eat, dance and buy a drink to kick back on the beach with. 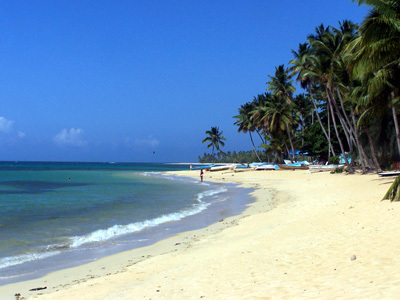 Unlike some of the other Beaches like Boca Chica where you are catered to by businesses right on the beach, most of the businesses in Las Terrenas are located on the other side of the road from the beach. This means you cross the street and head into the bar or restaurant if you want to get something. If you have read many of my blog posts you have probably realize that one of my favorite areas to visit in the DR is Las Terrenas. This morning (May 8, 2012) at about 5 am a fire was started that burned 16 of the restaurants and businesses in the area. The fire was located in the area of Pueblo de los Pescadores which is off from the street Fransisco Alberto Caamano Deno which follows the coastline as you head north. So far there hasn’t been any reports of which businesses were affected. although the report mentioned discos, bars, restaurants, art galleries and other businesses. 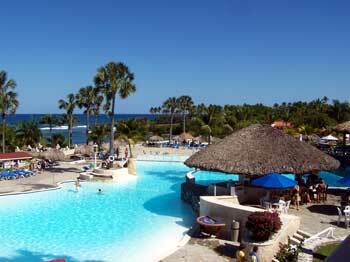 Playa Grande beach is on the northern coast of the Island of Hispaniola in the Dominican Republic. While this is a good beach for relaxing on and a fair beach for swimming (at least in the summer), it’s best known as a surfing beach in the winter. I’m not much of a surfer so I was talking with one of the Foreigners that live in the area. He explained why this was one of his favorite beaches in the area for surfing. First the people, you get a nice mix of Dominicans and Foreigners on the beach, most are relaxed and the competition for the waves is pretty lax. During the winter waves can reach 10-12 feet. Usually the best time to go is between December and March but the surf season can start as early as November. While I was there (Nov 8th) the surf was reaching 6-10 feet (counting from the front of the wave). The water can get a little rough; my surfing guide told me that this was rather unusual for this beach. I’m not up in this area much so I’ll have to stick with the pictures I took that day, the water was rough enough that there was a red flag on the beach indication that it would not be a good day for swimming or surfing. The latest in a barrage of tropical storms is heading in the direction of the DR. While it already has 65 mile per hour winds it is rather disorganized and does not appear to be likely to turn into a hurricane. It’s current direction gives the impression it will likely head well north of the DR and will only bless us with some more rain. We should be starting to feel the affects of the storm late Saturday to Sunday. Don’t cancel your beach plans for the weekend yet, Ophelia is expected to weaken over the course of the next few days. 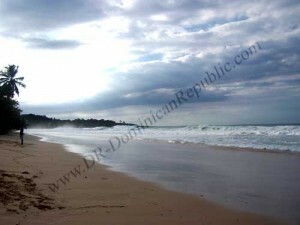 Hurricane Irene Damage report – Las Terrenas back to normal! 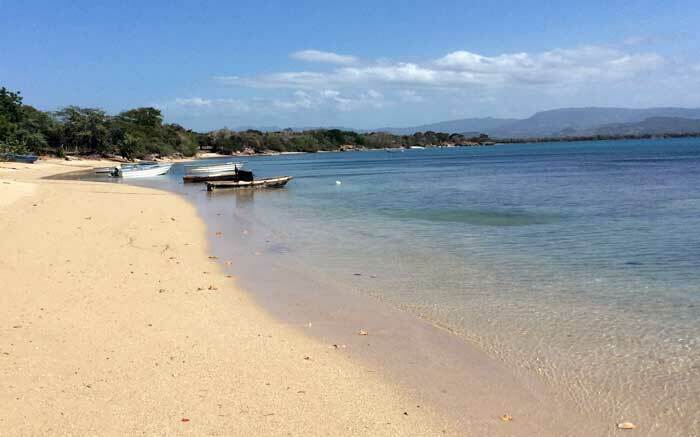 Comments Off on Hurricane Irene Damage report – Las Terrenas back to normal! Should I cancel my plans to visit the DR? Many people have spent a lot of money planning for their dream vacation in the DR and are now wondering if they should cancel their plans because of hurricane Irene. While it doesn’t hurt to call the resort or hotel that you plan on staying at it is unlikely that there is a need to change your plans. Buildings in the tourist areas, especially the resorts are constructed to withstand high winds and rain. The cute little thatch huts, umbrellas and other shelters near the beach are quickly rebuilt after a storm. During the storms businesses are shut down and locked up to protect the stores and restaurants. Islands like the DR get a lot of rain and wind at times and the business owners know how to keep things safe. One of my family’s favorite activities in the DR is snorkeling. We make sure to take our snorkel gear to every new beach we try. So far of the over a dozen beaches we have visited in the Dominican Republic we like the beach in Las Terrenas best for snorkeling, but there are a few tricks you need to learn to be able to have the best experience. Go in the morning. Most mornings the water is calm keeping you from being beat around as much by the waves. There is also less wind so the water isn’t choppy and you are able to see by the color of the water what is under the surface. This helps you to find the best snorkeling locations. Sunny, Cloudy or light rain doesn’t really matter. We do a lot of snorkeling in the rain, you don’t really even notice. Look for the right terrain. There are four different types of underwater terrain you will find in Las Terrenas. You look for the right color in the water, you can tell from a distance the best areas to snorkel. Dark Green: These are grassy mats. These are good areas to walk out to other locations on. While you may find some very small fish in the grass, this is usually not the best area to go snorkeling in. Blue, Light Blue: Usually these are the sandy areas and pools. You won’t find too many fish in the middle of these pools but as you go around the edges you will find more. These can however, be good areas to look for shells. Especially after a storm there can be quite a few shell laying around in these pools. Typically you will find conch shell, clam and other muscle shells (varied colors like white, purple, and dark rose to red), urchins (ball like shells) and a few other varieties, you can also find quite a bit of choral pieces. Dark Blue and Turquoise: Deep water areas. If you are a bit afraid of the ocean you will likely want to avoid these areas. I’ve found the best snorkeling to be in less than 10 foot deep of water anyway. You are more likely to find larger fish in these areas, but most beginner snorkelers choose the more shallow areas. Rust colored areas: These are areas with a lot of rock. These are the ideal snorkeling areas. The fish like to be able to hide easily. Large sections of this porous rock (rocks with holes for the fish to hide in) and coral beds make for the best snorkeling. Find a shallow enough area where you can touch a rock with your foot or hand to keep you steady and wait. Within a few seconds to a minute the fish will start coming out. Soon you will be treated to a wide variety of blues, greens and yellows from the schools of fish that will start surrounding you. 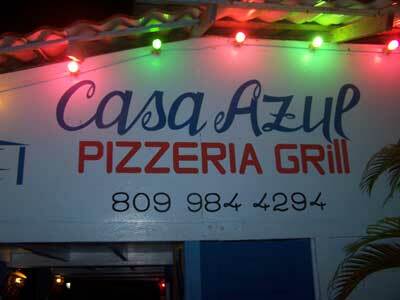 Then we come across Casa Azul in Las Terrenas. Well, it was made by Dominicans and very friendly ones but the result? Well, let’s say I’ve found a new favorite place to get a pizza! This pizza was made in an actual stone oven giving it a slight smoky flavor and as to be expected with stone oven pizzas you get the small close to burnt spots on the crust (something that many feel marks a truly great pizza) which actually adds to the flavor. The sauce was flavorful pizza sauce not the ketchup sauce that is frequently found in many pizzerias in this country. It was layered on a relatively thin, crisp crust that took in some of the smoke flavor from the oven.